Massive Open Online Courses (MOOCs) are going viral. 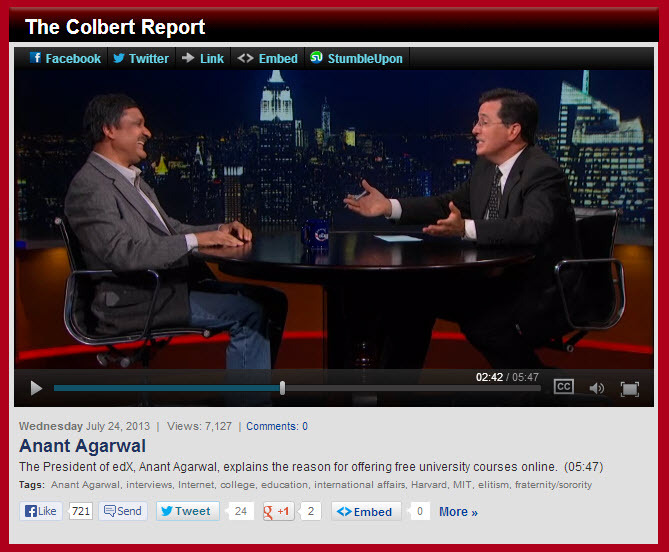 On Wednesday, Professor Anant Agarwal (@Agarwaledu), a pioneer of MOOCs, was a guest on Comedy Central's popular late-night TV show The Colbert Report (@ColbertReport). 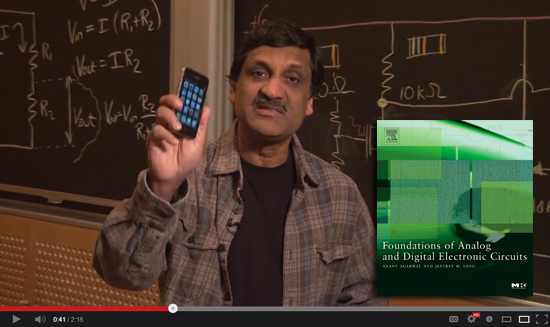 Dr. Agarwal is Professor of Electrical Engineering and Computer Science at MIT and founder of edX (@edXOnline), a MOOCs a global platform for MOOCS. He is also the author of the Elsevier textbook Foundations of Analog and Digital Electronic Circuits, which he arranged to offer online for free to students that take his MIT course through edX.He was featured by Elsevier Connect in May in article titled "A university education, for free." True to form, Colbert teased him with light-hearted comments like, "Why send the cow away to college if they're giving the PhDs away for free?" Professor Agarwal, in turn, conveyed his passion for the cause, saying, “It's really important that people around the world have access to a great education, like the air you breathe. ... An educated world is a better world for everybody.” He went on to say that it doesn’t replace a true campus experience, but it opens up education for everyone at a price everyone can afford — free. In fact, he's preaching to a growing choir. 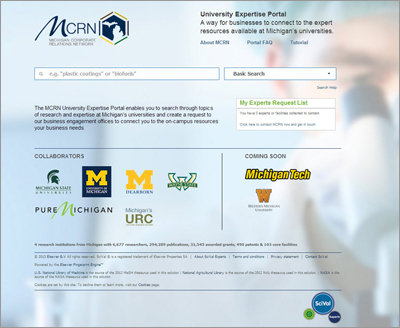 According to a recent Outsell report, 3.17 million students have taken a MOOC and that number may expand to 6 million by 2015. Students in 196 countries have already taken a MOOC. And MOOCs have being making headlines lately, the most recent buzz being about Georgia Tech's new MOOC master's degree program in computer science for $6,600.As for edX, Dr. Agarwal told Colbert, "We have over a million students from every single country in the world." Find out more about his free classes offered through edX.